This practical seasonal maths activity is based on the Argos Christmas catalogue for 2018. There are plenty available in the store to give one to pupils to complete these task cards. 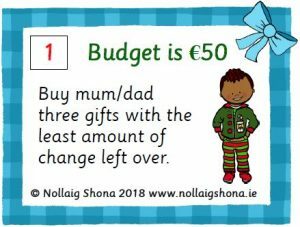 There are seven varieties of maths tasks for pupils to complete – all give the pupil a budget ranging from €20 to €200 to purchase two, three or four gifts from the catalogue. Pupils are asked to try to purchase gifts which give the least amount of change left over. This resource is aimed at pupils in junior/middle classes or SEN pupils who are working on numbers. It is based on the consolidation of numbers in the range 15-24. The resource features six puzzles using a variety of Christmas images. Laminate all of the pages in the resource and cut each one up into ten separate strips. Laminate another piece of A4 card. Adhere a long strip of velcro to the laminated card at the top and the bottom. Adhere a square of velcro to the top and bottom of each of the ten strips. The pupil then uses their knowledge of number order to position the strips correctly using the velcro to reconstruct the image. This is a seasonal resource for junior pupils and SEN pupils. 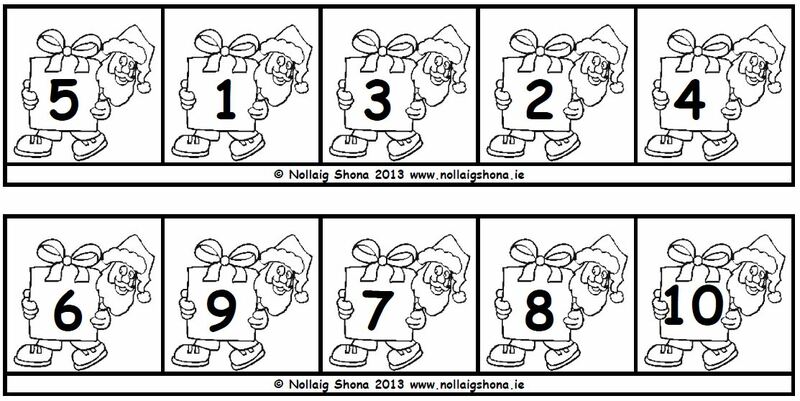 Pupils are required to cut out the Peeping Santas and arrange them in numerical order. Younger pupils could be required to only do numbers 1-5 and older pupils could do numbers 1-10. This is a seasonal resource for junior pupils and SEN pupils. Pupils are required to cut out the Christmas stockings and arrange them in numerical order. Younger pupils could be required to only do numbers 1-5 and older pupils could do numbers 1-10. This is a seasonal resource for junior pupils and SEN pupils. Pupils are required to cut out the Christmas gifts and arrange them in numerical order. Younger pupils could be required to only do numbers 1-5 and older pupils could do numbers 1-10. This is a seasonal resource for junior pupils or SEN pupils. 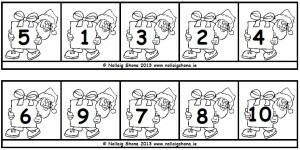 Pupils are required to cut out the Santa heads and arrange them in numerical order. Younger pupils could be required to only do numbers 1-5 and older pupils could do numbers 1-10. These seasonal maths sentence builder activities, featuring Christmas stars, are suitable for younger pupils and special needs pupils who are starting on early number activities. It teaches left to right orientation, number recognition and addition. They deal with the addition of the numbers 0 to 3. These seasonal maths sentence builder activities, featuring Christmas candy canes, are suitable for younger pupils and special needs pupils who are starting on early number activities. It teaches left to right orientation, number recognition and addition. They deal with the addition of the numbers 0 to 3. These seasonal maths sentence builder activities, featuring Christmas presents, are suitable for younger pupils and special needs pupils who are starting on early number activities. It teaches left to right orientation, number recognition and addition. They deal with the addition of the numbers 0 to 3. This is a simple video for younger pupils. 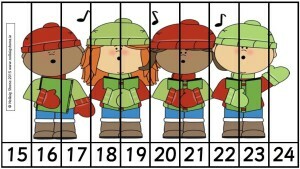 It is a counting song, with numbers 1 to 9, with a seasonal theme where pupils are counting Christmas bells.